Metro Magazine shares "They're the women you love to hate--but have also come to love: Magkaribal's Vera Cruz, Princess and I's Ashi Behati, Pangako Sa 'Yo's Amor Powers, and Tayong Dalawa's Ingrid Garcia have redefined the way we look at kontrabidas, and this month in Metro, they get together for a fashion showdown unlike any other! Angel Aquino, Gretchen Barretto, Eula Valdes, and Agot Isidro reprise their roles as Philippine television's most glamorous and memorable bida kontrabidas, on this luxe cover where they're all decked in Louis Vuitton's Autumn/Winter 2013 collection. Grab a copy of this issue, out now in bookstores and newsstands, to see the fashions of these TV queens redone the Metro way. Have a great week ahead, everyone!" The "kontrabida" queens are doing it "bold and beautiful" proving they are indeed televisions most glamorous antagonists. 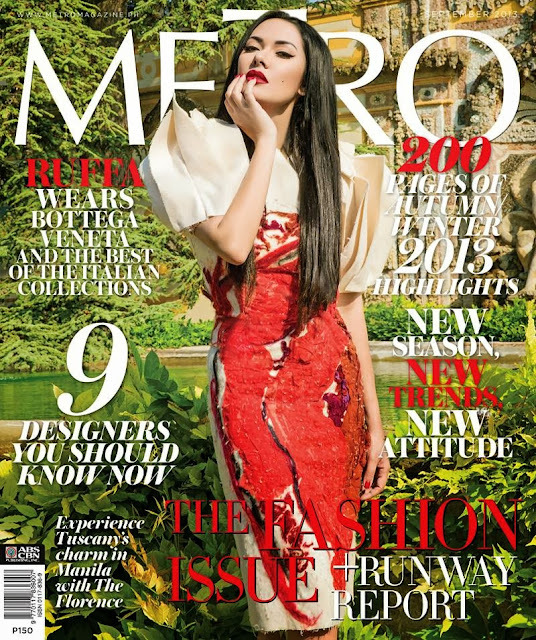 Last month's cover for September was Ruffa Guttierez and my golly - Ruffa was totally working it in Italy with two covers for Metro Magazine!!! It was so hot that it made it to Yahoo's hottest magazine covers for September! You have to admit you somehow hate her for that! Lol! Metro Magazine definitely chose women who can captivate everyone's eyes. They are not just good actresses but they are also blessed with beautiful faces.